刀具重复上下裁剪 The knife cut up and down repeatedly . 1.Coputer design, automatic typesetting, save original materials. 2.Use computer control to automatic cutting, which can instead of a large number of cutting workers and bulk production. 3.Support multi-source data format: it can directly receive the commonly used clothing design and typesetting software. 4.Adopt unique arithmetic and motion control technology, which can realize the seamless connection between straight line and arc. 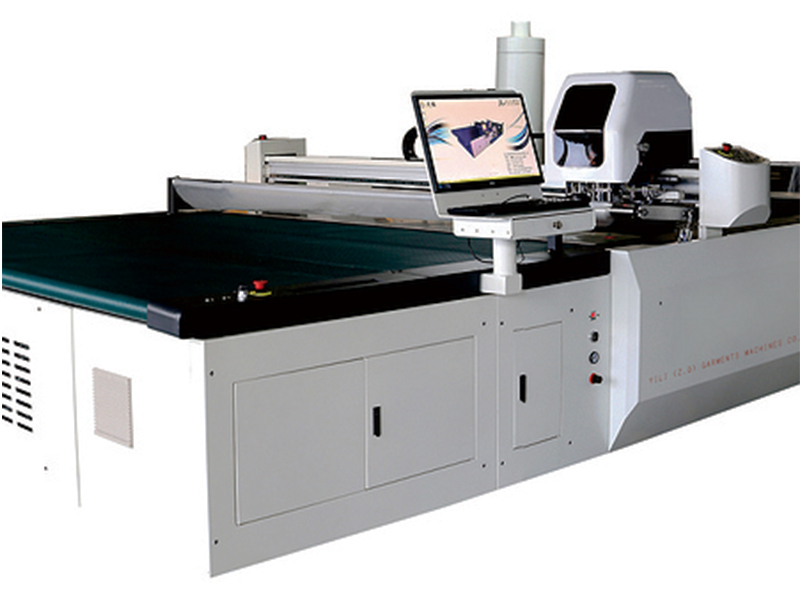 5.High cutting accuracy, automatic sharpening time can be designed , and long service life for the cutter. 6.No need to print out paper patterns, and it can save them, which is high repeated utilization and convenient to plate making and management. 7.More easy to change the consumable material and lower replacement costs. 8.High degree of automation and simple to operate. YZD automatic cutting bed is specially designed for cutting the suit, uniform, car cushion, home textile, cloth art sofa, cowboy wear, pants, bags and suitcases, women's clothes, etc. Its max cutting thickness after adsorption is 75mm, the effective length of conventional cutting is 2500mm, so it is suitable for cutting the products with big cut pieces. Also, it can reduce the feeding time and improve the efficiency of cutting effectively .